Hmm, I feel like I’m forgetting something. These thoughts will sometimes race through my head when I’m sitting down to focus on social media time. I’ll fire up Twitter and Facebook and Buffer and want really bad to ensure that I’m covering all my bases and spending time in the best way possible. And on the good days, I’m right into the groove where I know exactly what to do next and what are the most important tasks that need to get done. 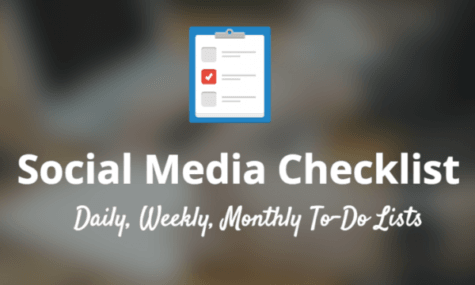 The difference for me is with making a checklist for my social media activities. We’ve found before that social media managers have a full-time schedule getting all their many tasks accomplished. As you might see in the below checklists, there’s lots to do! I’ve broken it down here into a daily checklist, a weekly checklist, and a monthly checklist as some of the activities vary in their frequency and need. Feel free to adapt any of this to suit your specific needs (here’s a free template that you can copy and edit). Keep reading for lots more info and explanation on each of the checklist items you see here! Download the social media checklist as a pdf here: Free and direct download here.